It was my first day at the camp of a hunting ranch in Northern Namibia. 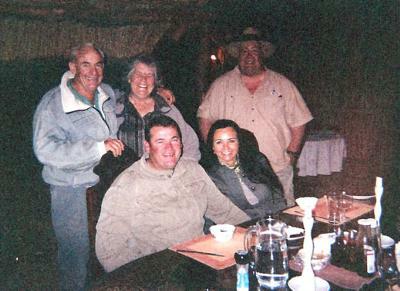 The previous night I had met all the hunters and guides in camp and had consumed a gourmet dinner of Gemsbok loin from the Braai, fresh bread, and fresh African vegetables. I slept through half the night in my thatch hut. At 0300 I awoke, took my flashlight and cigars, and went to the Boma in the center of the camp. The camp was powered by a generator and the camp was now dark. I placed fragrant, dense, and heavy Mopane wood on the coals of last night's fire. The fire soon blazed. I sat before the fire and warmed myself. At 0330 the generators suddenly kicked in and the lights turned on. The Leopard hunters were up. Derrick the guide, and Angel, the Spanish cat hunter, came to the fire. They slurped their coffee and ate hard biscuit in preparation for their hunt on foot. Derrick remarked that there were five Leopard on the ranch; three males, and a female and a cub. He said they were using a pack of South African curs to chase the Leopards. Derrick loaded his pre "64" Model 70 Winchester .375 H&H with shells, and he and Angel slipped into the night. The generator clicked off. I was left alone in the firelight. I lit up an Indian Tabac Madura Tomahawk Cigar and gazed into the fire. The Stephen Stills song, Southern Cross, played in my head. I looked up and saw the Southern Cross Constellation among the myriad of stars. I smoked my cigar, looked at the stars, and thought, "My God, I am in Africa. I am all alone and about to start a shooting safari." I asked myself, "Would I be worthy? Would I be up to the task?" Everything was new to me. My Professional Hunter would have to be my guide. I was an innocent in a Savage Land. There were Leopards and Lions on the ranch. For all I knew one could be stalking me now. I continued to gaze into the fire and the stars and thought of what an achievement this was for me in my life. I was halfway around the world about to hunt a variety of wild African animals!! The Crosby, Stills, and Nash song continued to go through my mind. I smoked my Nicaraguan cigar, warmed myself before the fire, listened to the Black-Backed Jackals howl, and drank African Coffee. At 0600 the generators kicked in and the camp awoke. Barry was to be my PH. Yassir, would be my Herero tracker and driver. I gave Yassir a cigar. This would be my practice throughout the hunt. He rolled his own cigarettes out of newspaper and tobacco. I thought he deserved a good cigar. We had fresh eggs and bacon for breakfast compliments of Miriam. We headed out into the bush. Barry wanted to hunt next to a waterhole the first day. Another hunter had shot a nice Kudu Bull at this waterhole the day before. Yassir dropped us off about one half mile from the waterhole. We walked over the extremely rocky ground and saw much Gemsbok and Zebra sign. I was fascinated and ever alert on the walk to the waterhole. It was my first time on African hunting soil. We approached the waterhole and placed ourselves in a blind of fresh cut vegetation. Immediately, hundreds of Social Weaver Birds began to alight on the watering trough. We heard the call of the Go Away Bird. I thought he was talking to me. We saw many Yellow Billed Hornbills. We heard the call of the Hoopoe Bird. All of a sudden a dark presence alighted on the waterhole. A large Black Martial Eagle had come to drink. The other birds left with the coming of the Martial Eagle. The Martial Eagle departed and a large Kori Bustard came to drink. The Kori Bustard is the worlds largest flighted bird. You may assume that Namibia is a dry lifeless land, especially for birds. To the contrary; there is tremendous avian life in Namibia, thanks possibly to the waterholes set up by hunting ranches. Hordes of Sand Grouse and Guinea Fowl drank at the watering hole. I saw a Pale Chanting Goshawk approach the Sand Grouse. The Goshawk flew at the Sand Grouse, then veered toward me in the blind. The Goshawk flew right to the entrance to the blind; I could have touched it; then it flew off. It was very exciting!! It was now about 0900. Suddenly, in the brush in back of the water hole a female Kudu materialized. She came out of no where. I got really excited and placed my scope on her to simulate a shot. The Kudu got jumpy and ran away. She had sensed my movement. Barry whispered to me that the females come first then the bulls. I was to remain still until a shot at a bull presented itself. Barry said that he realized how excited I was. I was a new kid on the block and appreciated his advice. From now on I would remain still. We waited another hour. I could hear the sound of the water pump in back of the blind. I could hear Barry sharpening his knife in back of me. All was still. Suddenly I saw three Kudu cows and two yearlings approach the water hole. I saw the flash of a horn. A young bull followed the cows. They moved ever so slowly, one step at a time, in perfect silence. I never saw such careful and silent movement by animals. The bull had about a one and a half curled horn; not a shooter. I remained perfectly silent. We watched the Kudu for about one half hour as they approached the water. They were so nervous and cautious that they did not drink. I remained silent and motionless the whole time. They eventually sensed our presence, barked, and ran off. I had experienced a wonderful time in the African bush. Barry congratulated me on remaining perfectly still. It was now about 1100. We continued to wait by the water hole. After awhile Barry quit sharpening his knife and said, "Gemsbok". I looked to my left and saw a beautifully colored animal. Barry whispered that the Gemsbok was a small one and we could do better. He was not a shooter. I was terribly excited. The Gemsbok approached the water and began to drink. After a while it left the water hole. It was now about 1200. Barry and I went back to camp for lunch. We had a substantial meal of Gemsbok Bolognese for lunch compliments of Miriam. Afterwards we rested for a few hours in the mid day heat. That evening, Barry's beautiful wife Lizelle would accompany us on our hunt for good luck. We went to a large water hole next to an abandoned homestead. The homestead had large windows to shoot through. We would be in the homestead and ambush any animal that presented itself. There were scores of Sand grouse and Guinea Fowl drinking the water. We saw a diminutive Duiker approach the water. We also saw a trophy Steenbok next to the water. I had traded the Duiker and Steenbok in my package for an additional Kalahari Springbok. They were good shooters however. At about 5 PM a large troop of Baboons came to the water hole. They were big, black, and evil looking with long arms swinging as they walked. Lizelle said that ,"Now that the Baboons had spotted us, it was no good to await any more animals". She was wrong. We heard the barking of Kudu. A large herd of thirteen female and young Kudu came to the water. They were immediately followed by seventeen young bull Kudu. What an immense herd!! Unfortunately there were no shooters in the male herd. I stayed perfectly still. We watched them for a while, then they dispersed. It was getting dark. We left the water hole. On the way back to camp Barry and Lizelle stopped to look at their Email. We stopped at a high spot. They took a chip out of their cell phone and placed it in their Email device. While they were reading their Email I looked into the sky and saw the Southern Cross. I again asked the firmament if I was worthy of this land... this country... this continent called Africa. Would I be as worthy as those who have tread here before me? The stillness of the stars offered no answer to my query. I had not been worthy yet but prayed that I would be in the future. I enjoyed learning about the animals that are in Africa. The part about the birds was very interesting as I did not know that largest bird was in Africa. Good picture also. I enjoyed this story of still hunting. It was very informative.